Fueled by Carbs & Coffee | Run, Lindsay, Run! On Sunday, I set off on a new journey. In an attempt to get onto a weekend long-run schedule (rather than before work), I was trying to get in at least 16 miles…a new longest run ever! I slept in, fueled up on a small bowl of oatmeal with dried cranberries and cinnamon and a cup few cups of coffee! I have a pretty sensitive stomach and don’t like to eat any weird foods before running, but for some reason coffee is okay for me. And let’s be honest, I neeed something to energize me on such a long journey. I digested for a good hour and a half and geared up to go. Oh and what a journey it was. I ran from my apartment, through Riverside Park, down the West Side Highway, through Battery Park City, down to the South Street Seaport, over the Brooklyn Bridge, over the Manhattan Bridge, down through Chinatown, back towards the Seaport and back through Battery Park city. PHEW! Getting tired just recapping it. BUT WAIT! Something serendipitous happened that made my run that much better. As I turned the corner near the Staten Island Ferry area around 8 miles, I ran into none other than…. Okay, no…Terence was not running 18 miles in his boxers unfortunately. I just wanted to post that picture for giggles. I do someday hope I have the good fortune to randomly stumble mid-run on him while he’s in this exact pose. It’s like he’s naked and dazed and wants yum yums. Then I know I’ve really hit a new hallucination point and probably need to stop running immediately. And it gets better! Since NYC is such a SMALL city, I saw him for a SECOND time around the 15 mile mark. I survived my run in around 2 hours and 8 minutes. The Nike+ said 17.5 miles, but I’m calling it 17 because I think it overestimated my pace a little since it was mostly an entirely flat route. After my run, I was ravenous. Great thing I had a fun afternoon in store at my friend Sarah’s apartment. 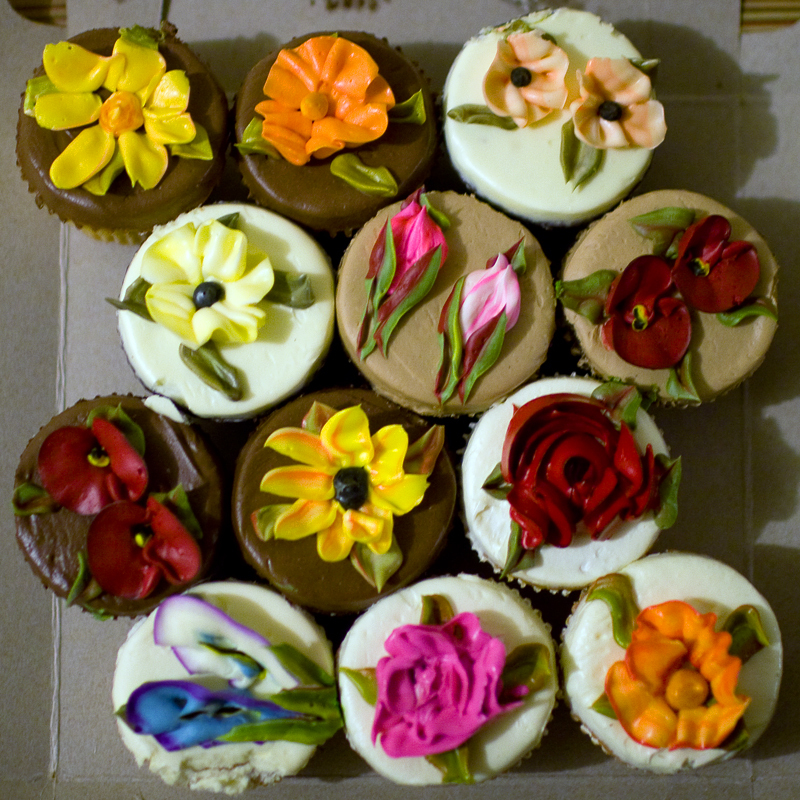 For her birthday, we had “cupcake wars”…everyone brought cupcakes from different bakeries in NYC and got to eat them all! 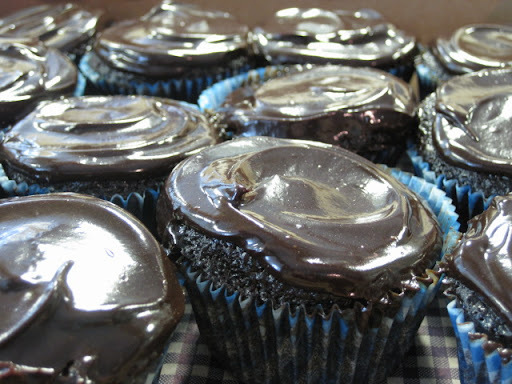 The winners for taste were the double chocolate cupcakes from Blue Smoke Bake Shop! It was so tasty! Great way to spend a rainy Sunday. So far this week, I did an easy 5.75 yesterday to shake out my legs post-run, and tried doubling today: 3 in the morning and 6.25 at night. Thinking of attempting a tempo tomorrow, but hope my legs feel a little more ‘springy’. I guess it’s just about impossible to expect to have fresh legs when I did 55 (okay, 54.5) miles last week. We’ll see how the rest of this week goes…have a big weekend in store: finally painting my bedroom! Feeling quite domestic. i love how you say i’d like to publicly embarrass myself when its not even embarrassing for you. it’s exponentially more embarrassing to me haha. good thing i’m ok with that. This makes me want to go for a long run . . . right now! Ironically, I know both Lindsay and Terence would support this too. Even if it is 11pm.